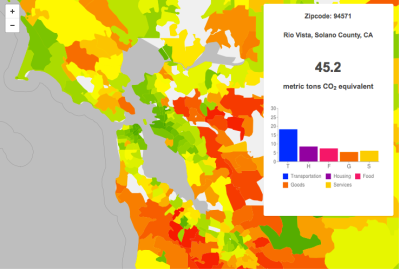 A CoolClimate Map of the SF Bay Area's carbon footprint by zipcode tabulation area shows a pattern typical of large metropolitan areas: a small footprint (green) in the urban core but a large footprint (orange and red) in surrounding suburbs.According to a new study by Dan Kammen and graduate student Christopher Jones at UC Berkeley, population-dense cities contribute less greenhouse-gas emissions per person than other areas of the country, but these cities’ extensive suburbs essentially wipe out the climate benefits. The study uses local census, weather and other data – 37 variables in total – to approximate greenhouse gas emissions resulting from the energy, transportation, food, goods and services consumed by U.S. households, so-called household carbon footprints. 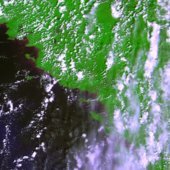 Proba-V’s first image of FranceI haven't used PROBA imagery, but many colleagues in Europe rely on this sensor. PROBA-V (i.e. "vegetation") was launched May 7. The miniature satellite is designed to map land cover and vegetation growth across the entire planet every two days. The data can be used for alerting authorities to crop failures or monitoring the spread of deserts and deforestation. Dr. Lisa Schile is off to Abu Dhabi for a postdoctoral research position with the Smithsonian Institution. She'll be working on a project monitoring carbon sequestration in wetlands. We checked out some of the available Abu Dhabi imagery on-line. The country has a long and interesting coastline, with many mangroves and wetlands, and of course the ever increasing coastal development. Here is a snapshot from NASA of coastal development. Lisa has started a blog, and taking lots of pics for us to see. 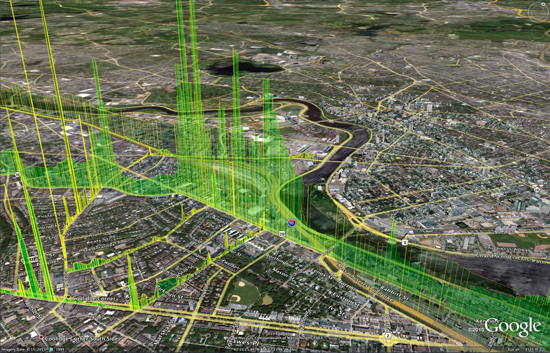 The Google Earth image above shows shafts of bright green indicating natural gas leaking around BU's Charles River Campus. If there are multiple leaks, the display “looks like a stock market index during a busy day,” says Nathan Phillips. Photo courtesy of Nathan Phillips and Picarro, Inc.This is a very interesting report about work at BU Geography and Environment department to map gas leaks across the city. Nathan Phillips, Bob Ackley and Eric Crosson use a Nissan-mounted methane sensor to survey for leaks, and map results on a google earth scene. The accompanying video shows the setup, and discusses some nasty real time implications for trees as gas replaces oxygen in the soil. Also, this is just nuts to think of how much wasted gas is going up in a typical city. Yikes! 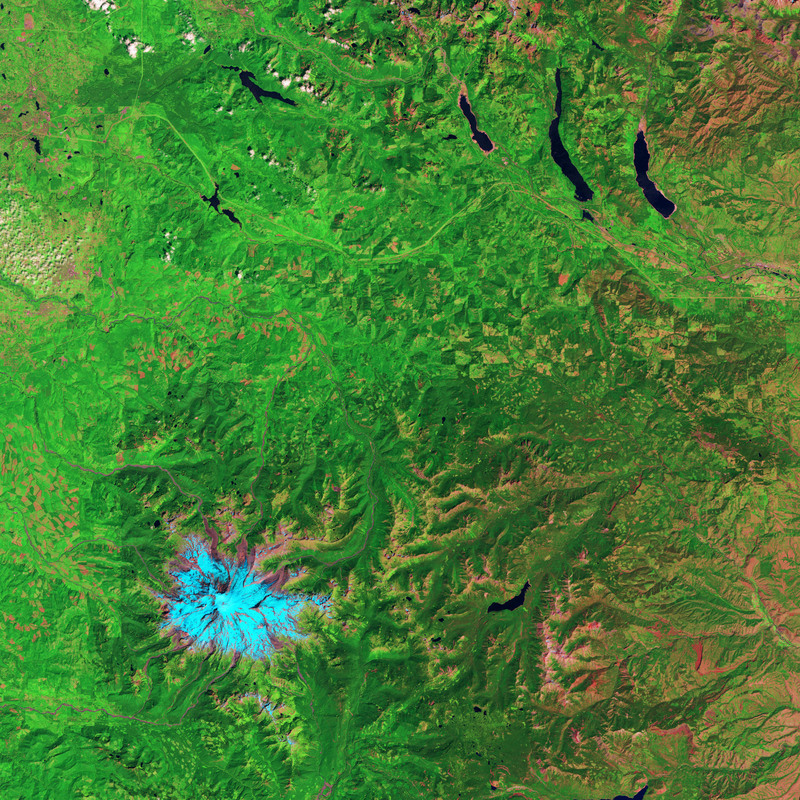 Clark Labs recently received a $451,000 grant from the Gordon and Betty Moore Foundation to support the development of land-cover analysis and REDD tools for use on Google's Earth Engine. REDD, Reducing Emissions from Deforestation and Forest Degradation, is a climate change mitigation strategy that offers developing countries incentives to reduce forest carbon emissions. The complex implementation of REDD relies on substantial computing and data resources, and requires significant effort and investment. It is hoped that providing accessible modeling tools with Google’s cloud computing resources and wealth of geospatial data will encourage broader adoption of REDD. 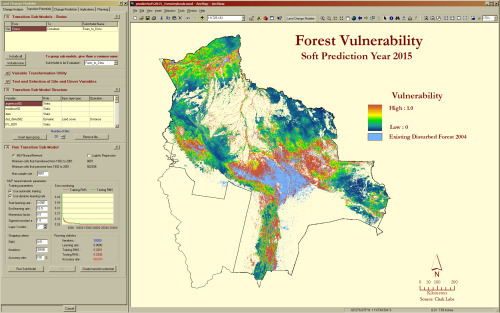 The grant supports the development of a prototype of the land change analysis and prediction tools for Google.org’s Earth Engine platform, a technology in development that enables global-scale monitoring and measurement of changes in the Earth’s forests. It is planned that Google will host the required geospatial data layers to implement a REDD project, including maps of those factors identified as critical causes of deforestation, such as proximity to roads, slopes or distance from existing deforestation. The new tools in development will guide the user through the steps of baseline development--land change analysis of the reference, project and leakage areas of a project, the identification of the carbon pools and input of carbon density values, and the estimation of emissions for projected dates. This new functionality will also directly produce the multitude of tables and graphics for the carbon accounting reporting requirement of REDD. The preparation costs of REDD will be significantly reduced by the automation provided by these tools. 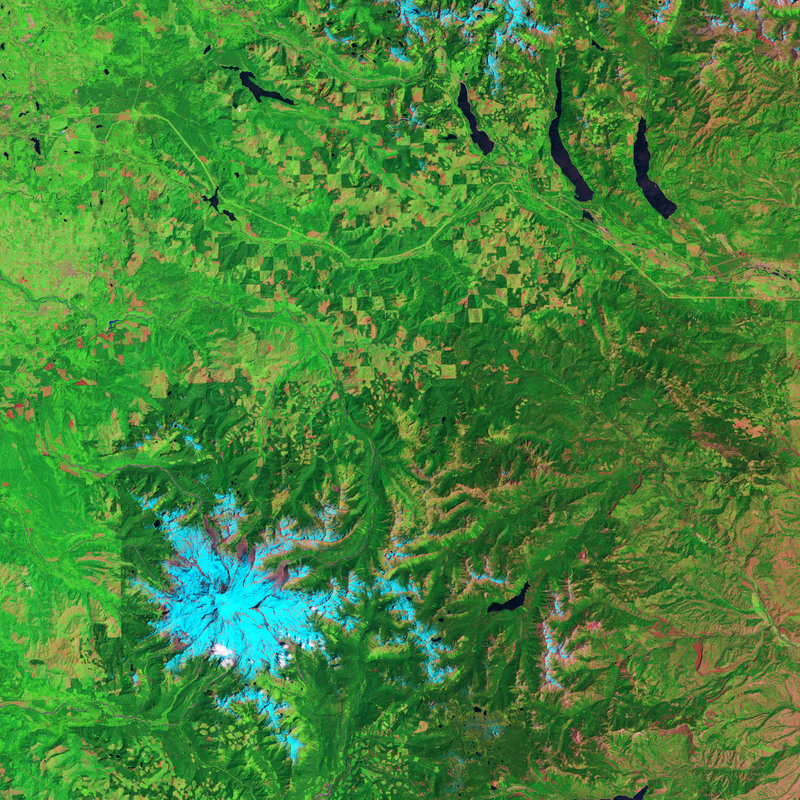 Clark Labs is based within the Graduate School of Geography at Clark University in Worcester, MA and is the developer of the IDRISI Taiga GIS and Image Processing software and the Land Change Modeler software extension to ArcGIS. To view the full news release click here.